All-round good times are a guarantee when you come to Winnipeg. And how could they not be when you discover our tight-knit LGBT community – a community who is so involved in our incredibly affluent arts scene, our ridiculously delicious culinary scene and above all our welcoming, incredibly hospitable character. Winnipeg is home to one of the largest LGBT populations in Canada between Toronto and Vancouver. We also hold the distinction of being the first major North American city to elect an openly gay mayor (1998-2004). 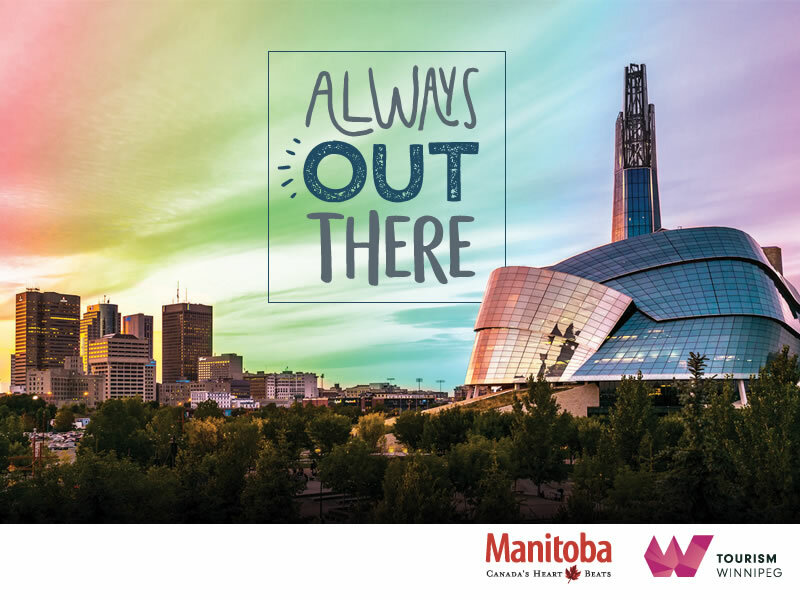 Our safe, encouraging city is steeped in LGBTTQ* history and boasts world-class cultural institutions like the Canadian Museum for Human Rights and Canada’s Royal Winnipeg Ballet. We have great nightlife, an innovative design community, outstanding coffee shops, wine bars and shopping, and our whole river-situated city is studded with verdant parks where patios and gardens abound. Winnipeg has long been a welcoming city, with a community that has seemingly always fought for for LGBTQ* rights. You’d have to look all the way back to the 1920s to find our first underground gay establishments – which you can, via the University of Manitoba’s Manitoba Gay/Lesbian Archive’s Oral History Project. One of Winnipeg’s first notable gay bars was Club 654, a members only after-hours club where liquor was not sold. Club 654’s opening, on a Sunday afternoon in 1970, attracted over 200 people. A year or so before this, on Halloween night in 1968, the first drag ball was held in Winnipeg at the Sildor Ballroom. Unlike notorious “raids” at other gay clubs in cities across Canada, there were no raids at Winnipeg’s gay bars. This tolerance has been attributed to the work of people like, the Honourable Ruth Krindle, the now retired judge who was instrumental in advocating LGBT rights, including being counsel for Winnipeg’s first gay club in 1969. Within this environment, by the early 70s, notable establishments like Happenings Social Club (1974-2002) and the Mardis Gras offered the community a place to call their own. The 70s also saw a good deal of equal rights marches which had been fostered by Winnipeg’s politically active university campuses. It was also during this time that the Manitoba Gay Coalition was established, which included organizations from the more rural communities of Thompson and Brandon. Winnipeg’s community has always been well represented in its artistic endeavours. A noteworthy example was the 1980s public access television show Coming Out. This program, which featured openly gay people, was pretty much unheard of at the time. Also of note in the 1980s was the opening of Giovanni’s Room in 1982. This legendary club, which would become Gio’s Club and Bar, stayed open for 31 years and was often considered the heart of Winnipeg’s LGBT scene. Winnipeg’s first pride parade took place on Sunday, August 2, 1987 on the heels of Manitoba’s Human Rights Code -- which protected the rights of gays and lesbians – being past. This first parade featured 250 participants, several of whom wore paper bags over their head for fear of being ostracized. The Pride Winnipeg Festival has taken place ever since, growing from a single day event to a 10-day celebration. It was a huge moment in Winnipeg’s proud LGBT history, one that may only have been eclipsed when Glen Murray – an openly gay man who had spoke to Manitoba’s legislature before the passing of The Human Rights Code – was elected mayor in 1998. He would later be re-elected in 2002. For more on Winnipeg’s proud LGBT history check out One Gay City: A History of LGBT Life in Winnipeg, a documentary by the CBC which you can watch here. Nearly anytime of the year you visit you’re sure to find a great festival going on in Winnipeg, from Festival du Voyageur in the winter, to Pride of the Prairies – central Canada’s largest pride festival – in early summer. Winnipeg has one of Canada’s most robust and lively arts scenes, with institutions including Canada’s Royal Winnipeg Ballet, The Winnipeg Symphony Orchestra, the Royal Manitoba Theatre Centre and Prairie Theatre Exchange. As well, venues around the city – including The Park Theatre and The Gas Station Arts Centre – often house cultural events ranging from comedy, to the Winnipeg Fringe Festival, to contemporary dance. Our top ten must-see attractions offer a little bit of everything, from outdoor adventure, to hidden gem tours, to one of the most luxurious spa experiences you’ll ever find. Pride of the Prairies, Winnipeg’s annual pride festival, takes place in late May to early June. This multi-event, multi-day festival is one of the largest pride events in Canada held between Vancouver and Toronto. For three decades Reel Pride film festival has been showcasing, celebrating and fostering dialogue through the presentation and discussion of queer media arts. This year, to celebrate its 30-year anniversary, the festival will feature several events, screenings and a dance party at the Gas Station Theatre. The actual festival takes place from October 13-18. For more info check out #30YearsOfReelPride. The Canadian Museum for Human Rights is an architectural marvel where an immersive journey through human rights issues is waiting to be explored. Since its opening in 2014, the CMHR has been celebrated by members of the community for not shying away from depicting the stories of LGBTTQ peoples in various times and nations. Throughout its massive galleries detailed histories run the gamut from celebration to heartbreak; you’ll see the triumph of marriage equality in Canada, read about the plight of queer refugees who have found asylum in Canada, while you’ll also witness the persecution the queer community has faced under both dictatorships and democracies. This powerful museum is unlike any place else in the world and is a must on your visit to Winnipeg. Great times when the sun goes down are always on the agenda at one of Winnipeg’s LGBT clubs, both of which are located in the heart of downtown. The dance floor is always hopping at Fame, which tends to attract a younger crowd with go-go dancers, DJs spinning the latest beats, and an ambient lounge. Close to many of the city’s hotels, Club 200 has been Winnipeg’s “see-and-be-seen” hangout for well over two decades. It features pool tables, karaoke nights, a full-service restaurant and a packed dance area where clubbers can bust a move. LGBT proud dining establishments also abound. The Oakwood Café is South Osborne neighbourhood favourite where all the classic diner fare is made from scratch – often resulting in lines during lunch and dinner. At the Capital Grill and Bar in Charleswood owners Wayne and Greg have brought their proven concept from Vancouver, and have become the restaurant of note in the area with incredibly well executed upscale comfort food like pan roasted halibut with lemon-ricotta gnocchi, a killer fish and chips, Dungeness crab cakes, and a bison ribeye to die for. Also of note is Sherbrook Street’s (which is an excellent street for dining) The Tallest Poppy. This place does it all from an exceptional brunch where the chicken and waffles receive rave reviews to late night handmade cocktails. They also host the Queer People of Colour (QPOC) ladies’ night on the first Saturday of every month. Winnipeg also a plethora of nationally acclaimed restaurants including Segovia in Osborne Village, Deer+Almond in the Exchange, Enoteca and Pizzeria Gusto in River Heights, and Vera on South Osborne. That being said, every neighbourhood in the city has its gems, from established hole in the wall institutions, to new rooms that are just waiting to crack Canada’s annual best restaurant lists. You can read all about them in our comprehensive Culinary Guide. Must-see neighbourhoods include Osborne Village and the Exchange District. Osborne Village was named Canada’s greatest neighbourhood in 2012 and features a vast array of restaurants, bars, live music venues and a fine selection of boho and chic clothing shops while the historic Exchange District is studded with stunning heritage buildings that house terrific galleries, top-notch artisanal coffee shops, and fun, funky clothing, shoe and design stores. No matter what you are looking for, chances are you’ll find it in our diverse, entertaining city where no matter the season, day, or hour, there is always an area, venue or event waiting to be explored. Nearly every area in Winnipeg is awash with comfortable accommodations – from luxurious properties and chic boutique hotels downtown, to our airport properties that are rich in design and close to all the best shopping, to our southern properties that are right in on all the action surrounding the stadium and the great outdoors. For a welcoming stay in a supportive environment committed to promoting equality, diversity, and giving back to the community may we suggest these TAG Approved® hotels: the Delta, the Four Points by Sheraton Winnipeg South, the Hilton Winnipeg Airport Suites, the Grand Winnipeg Airport Hotel by Lakeview, Fairfield Inn & Suites Winnipeg, The ALT Hotel and the Fairmont Winnipeg. For a complete list of winnipeg accommodations, click here. You know all about Minnesota Nice. This is Winnipeg Nicer, 700 miles north, but with almost tropical warmth in its welcome. Why visit? Three answers: for the arts. For the eats. And to wander the unique neighborhoods. Plus, the intriguing history, far older than our own. It was a hot summer’s eve my first night in Winnipeg. I found myself enjoying creative cocktails at one of the city’s finest eateries, Dear + Almond, while chatting with Jeff Myall, a vice-president on Pride Winnipeg’s board. I was visiting Manitoba’s capital for three days to explore all the city has to offer, keen to discover what’s new, trendy and trip-worthy for Canadian queers. Winnipeg is one of those Canadian cities that many people love to make fun of, with such monikers as Winterpeg, poking fun at the long, harsh winters that are typical for the region. It’s most likely for this very reason that the city has carved out its own unique niche within Canadian culture. Winnipeg’s LGBT community has flourished alongside its ever-growing arts and culture scene. Known as one of Winnipeg’s hippest areas, Osborne Village is home to the city’s coolest spots for food, theatre, and culture. Pride Winnipeg is the main event in this central Canadian neighbourhood. Manitoba, home to the bustling city of Winnipeg and the remote wilds of the Arctic. Want to see the Northern Lights and watch polar bear cubs learn to hunt? That’s all within reach in the magical town of Churchill. If you’re more into city vacations, Winnipeg is earning a growing reputation as a city to visit, thanks in part to popular attractions like the architecturally stunning Canadian Museum for Human Rights. Winnipeg Pride is the Pride of the Prairies – one of the largest celebration of LGBTTQ culture between Toronto and Vancouver. 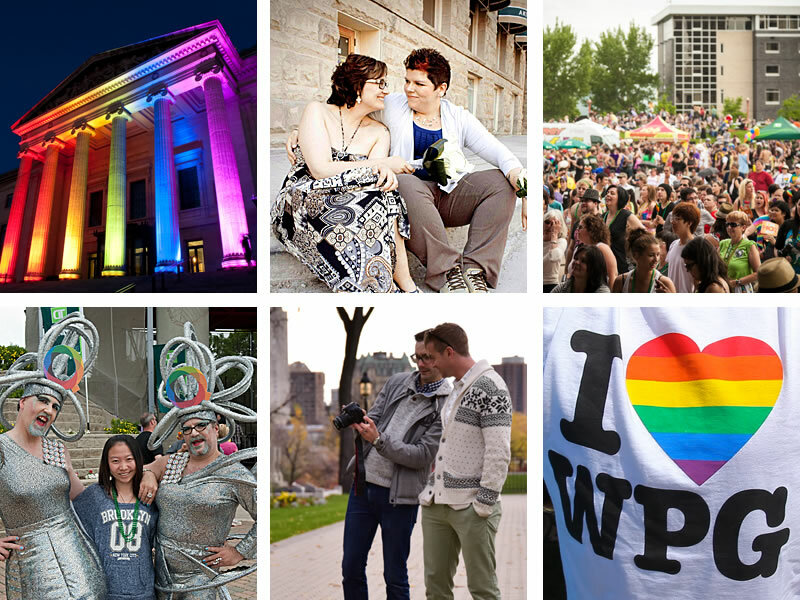 We invite everyone from far and wide to join our welcoming community and celebrate Pride in Winnipeg – the heart of the continent! Gaywinnipeg.ca is an online social community that connects Gay, Lesbian and Bisexual people with friends and others who work, study and live in Winnipeg. You can use gaywinnipeg.ca to reach other gays in your area and to learn more about those people you meet online. We are the first and only community based information website for Gay, Lesbians, Bisexuals, Transgendered and Two-spirited people in Winnipeg. We have been online since June 4th 2002. We invite you to explore gaywinnipeg.ca and to take time to familiarize yourself with the site and its many features. REEL PRIDE exists to celebrate queer media arts and to contribute to community vitality by programming materials that focus on issues of importance to Winnipeg’s queer community. We promote queer media arts to foster dialogue on issues of importance to our community in a public, accessible and safe space, as well as celebrating queer artists and stories both locally and from around the world. Travel Gay Canada is Canada’s national LGBT tourism industry association. Its goal is to provide LGBT travelers with products and services that meet their needs and expectations, and to better inform them of the unique and vast travel opportunities and experiences available within Canada. A comprehensive website dedicated to listing LGBT welcoming hotels and attractions, the perfect choice for pleasure, business, or meetings and events. GayCities is the #1 gay travel website and App where you can find the best experiences at home and in over 220 cities across the globe. The Manitoba LGBT* Chamber of Commerce exists to help build a strong Manitoba economy supported by, and supportive of, diverse communities. Our mission is to cultivate, contribute to and promote a thriving community of LGBT* owned and allied businesses, professionals and business students in Manitoba. Out There Winnipeg is an umbrella sports organization for the queer community in Winnipeg, providing opportunities for everyone to participate in sports and other recreational activities in good company with other members of Winnipeg’s LGBTTQ* community. Serving the GLBT Community Since 1994. Outwords is a non-profit organization that publishes outwords a free magazine that provides news, analysis and entertainment for the gay, lesbian, bisexual, transgender, two-spirit and queer community and its allies. Article written by Andrew Dobson from October 5, 2015. Article written by Rob Salerno from Oct 4, 2013.